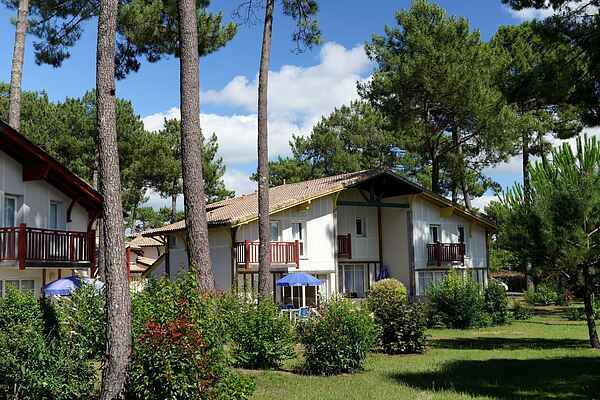 At the comfortable holiday resort Les Villas des Greens du Bassin, you have a choice of different types of holiday homes. The apartments, houses and villas are built in the local Landaise style. All accommodations are spaciously designed and feature a private terrace or balcony with a seating area. The furnishings are comfortable and neat, but can differ depending on the type. There's parking space available not too far from your holiday home. Type FR-33470-10 has a selection of apartments (for six people). The apartments are housed in four small buildings of two or three floors. Apartment FR-33470-10 has a bunk bed in the second bedroom and a double sofa bed in the living room. Or you could also opt for a connected holiday home FR-33470-08. Here you have two bedrooms (upstairs). The bathrooms and toilets are located either upstairs or downstairs. All homes have a washing machine and an alcove with bunk beds or twin beds. The villa, FR-33470-09, located directly on the golf course, also has a carport, a mezzanine with two single beds and a garden with a private swimming pool (mid-May – mid-September). Bedroom 1 has an en-suite bathroom.